How do you bring the teachings of The Tibetan Book of Living and Dying into your daily life? To continue the celebration of 20 years of The Tibetan Book of Living and Dying, over the next few weeks we’re asking you to send in stories about how–in even just the smallest of ways–you bring the wisdom, compassion and insight of Sogyal Rinpoche’s book into your daily life. Maybe it’s meditation, or a practice of compassion, or even just the notion that leading a life full of stress, aggression and relentless short-term goals is not the only option there is. 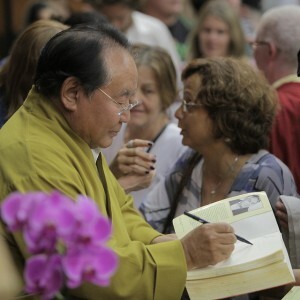 Whatever it may be, if you send in your story along with your name and a good photo or two, then at the end of this month (November), you will be entered into a drawing to win a free copy of The Tibetan Book of Living and Dying signed by Sogyal Rinpoche. There are 5 signed-copies to give away courtesy of Rider Books, so if you send us something, you’ve got a real chance of winning. Just send an e-mail to livinganddying@rigpa.org.